Karina's Kreations: Joanne's Shoe Box Swap! One of the best things about being a Stampin' Up demonstrator are the friendships you make. I have a wonderful group of friends that get together once/twice a month to share ideas & swap cards. This month we did a shoebox swap. 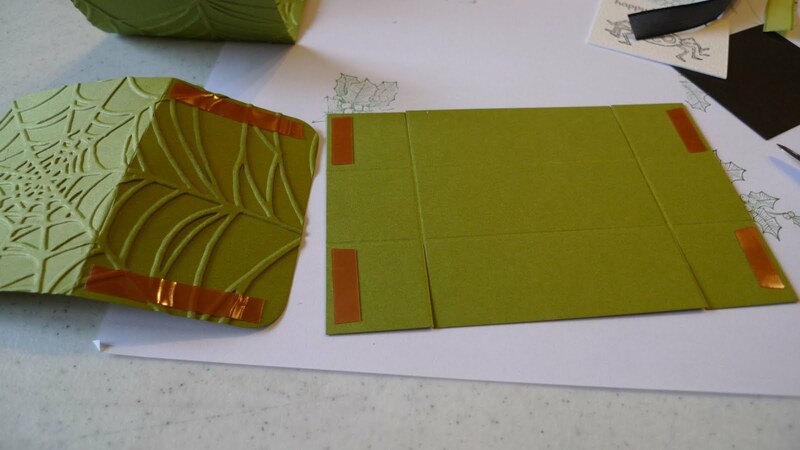 Every person comes with a card or project and cuts enough card stock for everyone to make one. It's like a class but you only cut for one card. This was Joanne's project. 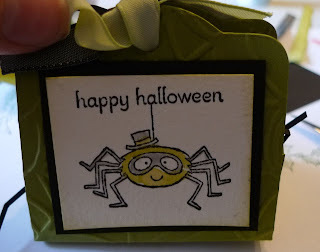 She made a cute little treat holder using the Bigz Two Tags Die. We cut two tags out of Old Olive card stock & Two Tags Bigz Die and ran them through the Sider Web Textured Impression Embossing Folder. Sticky strip was put on the bottom of one of the tags and they were joined together. The box is 4-5/8" x 3" scored at 1" on every side. Cut in to the score line at each of the four corners and secure with sticky strip. The stamp set is called Kidoodles from the Idea Book & Catalog. The spider was stamped on Watercolor paper and colored in with a Blender pen and Classic Ink. Thanks for the project Joanne.